1. Put the stock and 1 tarragon sprig in a large, shallow pan; bring to the boil, then reduce to a simmer. Add the chicken, leeks, carrots, potatoes and shallots and simmer for 8 minutes. 2. 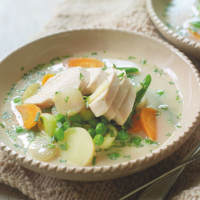 If the chicken breasts aren’t immersed in stock, turn them over. Add the peas and beans and simmer for 4 minutes, or until the meat is cooked through. 3. Remove the chicken and slice; discard the tarragon sprig. Stir in the crème fraîche, lemon juice and leaves from the remaining tarragon, chopped. Season and serve topped with the chicken.